So we’re one month down! You guys surpassed my expectations again and linked up 22 different reviews (five of them in Finnish!). Thanks so much for being such willing participants. I’ve read about a bunch of different books that I was previously unfamiliar with and I fear my TBR list is getting even longer. If it wasn’t already kind of late, I would totally create charts and graphs or something. Personally I didn’t read either of the two books I’d originally planned for (The Pearl Wars and Partials), but I did still cover two areas with my reviews of Robopocalypse and Cyberlife. This month my priorities are Partials by Dan Wells and Article 5 by Kristen Simmons (both eligible for YA and Dystopia). I think as long as I stick to two sci-fi books a month, I will easily hit my goal of two books in each category. And now here is the linky for February. Tell me what you’ve been reading or plan to be reading soon. 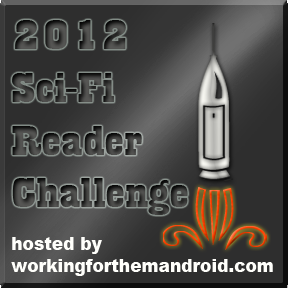 I look forward to chatting about more great sci-fi as we explore the genre together! When you link up your review, please put it in the format of Name (book title) category, so when I review Partials, I’d submit it as “Leslie @ WFTM (Partials) YA”. That worked out pretty handy with my tracking.